Who would guess that X Factor boy band sensation One Direction have two students from Norway to thank for turning them into overnight fashion icons? Harry Styles, Liam Payne, Niall Horan, Louis Tomlinson and Zayn Malik have all donned quirky jumpsuits from Nowegian label OnePiece Jump In. UK president of OnePiece Jump In, Ole Fjelberg, a student in London – and his girlfriend, Randi Versto Kaasa, decided to bring these distinctive styles over from Ole’s home town of Oslo after they’d gained cult style status in Norway. Speaking exclusively to Now online soon after One Direction wore OnePiece jumpsuits during their time on The X factor, Ole revealed: ‘The OnePiece Jump In suits were originally designed to wearing the mountains after a hard day of skiing but they fast become a fashion statement. 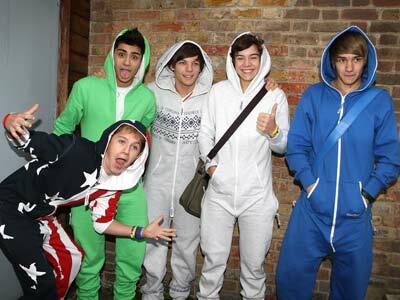 One Direction‘s jumpsuits start from £80-130, available from OnePiece Jump In.